Order the best Quality L'Amour Satin Ballroom Banquet Chair Covers in beautiful Aqua Color. Fabric: L’amour Satin aka Polysatin. L’amour Satin is also known by the name Podesua. Fabric Description: A critical fabric in the event industry. L’amour Satin or Polysatin is a great fabric for your basic tablecloth needs. L’amour Satin is a Heavy Semi Dull Satin; Greater quality, smoother touch and hand feel. Made of 100% Polyester, this fabric is great for tablecloths, linens and more. Original intended use was for the Apparel Industry, specifically Wedding Gowns. Fabric is made in Korea. Please do not compare our L’amour Satins to our counterparts. Most L’amour Satins in the Market are Chinese/Vietnamese Made which do not compete to our superior Korean made quality. 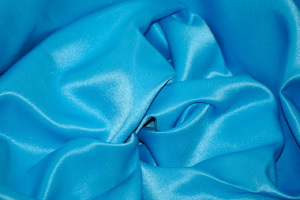 Fabric Weight: Heavy Weight Satin, Semi Dull Satin Touch. Soft Hand Feel. Very Durable and reusable. L’amour Satin is machine washable. Wash on cool, gentle, no bleach. This Satin should be cleaned in a tumble type washer on a cool, gentle cycle. We always suggest dry cleaning to preserve fabric life-cycle. Please allow a approximately 5 business days. Lead times may extend up to 10 business days or more during peak seasons. Please provide sufficient time between order date and event date. Color availability is subject to change without prior notice. If selected color is not available or out of stock we will contact you immediately. Please be advised that all computer screens are configured differently and therefore will display colors differently. The swatch colors displayed below are very close representations of the actual fabric shades, but may not be exact. If slight color discrepancies are not acceptable for your application, please request a swatch. Copyright © 2017 On The GO Linens. All Rights Reserved.